Bruce likened the situation we are in with HTML 5 to a Temple he had visited in northern Thailand. The temple had been built in a modern way for the future, and yet it took into account historical needs. The temple won’t be finished for another 75 years, but will evolve into the changing needs of society. 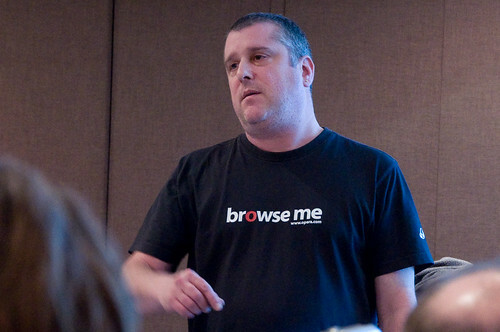 So, HTML 5… It’s modern, future proof and it’s backwards compatible with our current needs, all at the same time. The arguement for HTML doesn’t end there, though. It contains other advancements which will be present in newer and modern browsers when they are released. HTML 5 introduces a number of features and makes advancements possible in lots of ways. In order to put together the tags to be used within the new spec, loads of websites were surveyed. The most popular classes and ID’s within existing HTML were collated and analysed to find those that should make up the next set of tags. HTML 5 opens up some basic tools which will become the standard for web development. These include things like drag and drop, canvas, sockets, storage, web workers and more. These will give web designers and developers much more as standard, and allow them to concentrate on moving beyond creating the basics every time. The built-in date picker, range slider, calendar and standard validation code means that coding up forms will be much easier in the future. It will also mean that it’s easier to acheive a higher standard and basic functionality which has come to be expected from most websites. By introducing additional tags and establishing standardised naming conventions, this paves the way for better accessibility within websites. Headers, navigation, articles and footers will all be better identifiable and recognisable to screen readers like NonVisual Desktop Access. Whilst the actual format which will be supported best in the future is still under debate, the ease at which HTML 5 can incorporate video into the web is excellent. Whether it’s MP4, webM or OGG, the video will be clean, fast and high definition in quality. Video players can be easily styled and subtitles and language support can be implemented quickly and easily. Although the final list of element tags is yet to be decided, HTML 5 is available to start implementing now. Elaborate hacks may be needed for some elements to gain backwards compatibilty and some parts are subject to change. If there is one thing that I have learned from this, it’s that HTML 5 has been well considered, defined using empirical evidence and is based with growth in mind. It’s a way forward for a better web with standardised elements and better accessibility. Overall, it sounds like a web which has been considered for the user.